NEW: Source folder list: Now you can activate a file protection for each source folder. 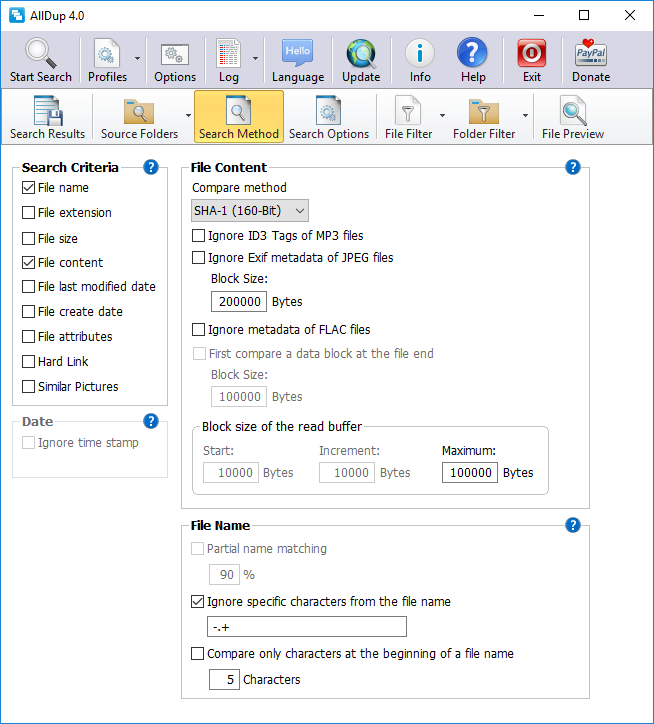 The file protection enables that no files will be deleted, moved or renamed inside the source folder. NEW: Profile list: Added the editable column 'Comment'. NEW: Main Toolbar: Now the button 'Log' shows the log of the last search inside the program. NEW: Options / General: Added the option 'Automatically check for new beta versions once a day'. NEW: Options / General / Updates: Added the button 'Check now' to check for new updates any time. 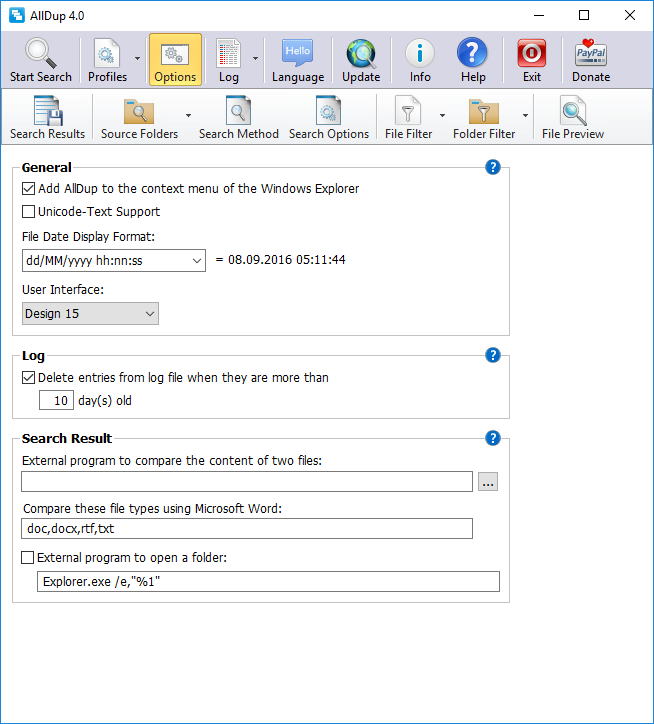 NEW: Stored search results / Context Menu: Added 'Open log file'. UPD: Stored search results: The column 'comparison criteria' was renamed to 'Comment' and now also can be edited. NEW: Search method: The new comparison criteria 'Similar Music' enables you find the audio files that sound similar. Audio files with the following file extensions are supported: MP3, FLAC, WMA, WAV, OGG, APE, AAC, MKA, M4A, M4R and MP2. 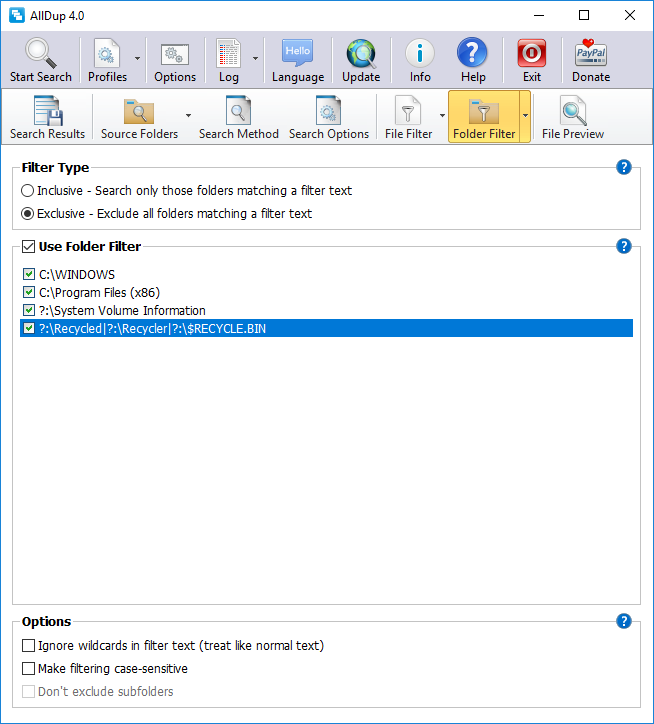 NEW: Search method / Comparison Criteria 'File name': The new option 'Ignore text patterns from the file name' enables you to ignore multiple text patterns from the file name. UPD: Search Method / Comparison Criteria 'File Content': Using the 'Ignore ID3 Tags of MP3 files' will ignore now ID3v2.x tags at the beginning of the file that exists twice and ID3v1 tags at the end of the file that exists twice. NEW: Search options / Archive files: Now archives with the following extensions can also be scanned for duplicate files: ARJ, CB7, CBR, CBT, CBZ, EPUB, LZH, LHA and NRG. NEW: Search options / Archive Files: Now splitted archive files with the following extensions will be searched: '.zip', '.zip.001', '.rar', '.part1.rar', '.7z.001' und '.tar.001'. NEW: Search options / Archive Files: Added the option 'Scan the following archive types'. 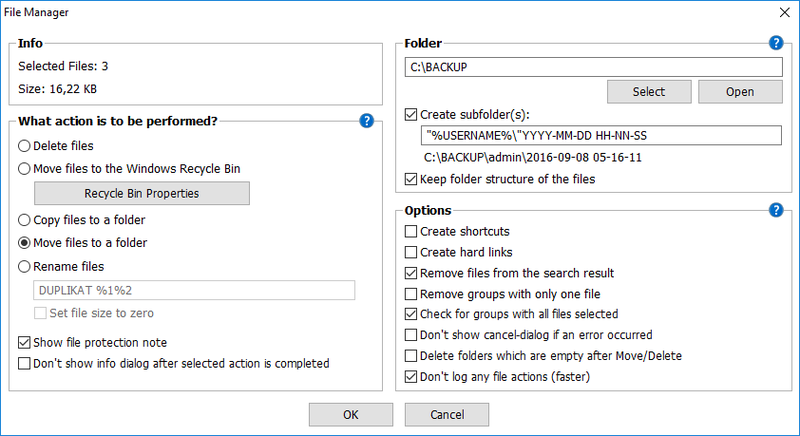 NEW: Search options / Archive Files: Added the option 'Delete temporary files after their checksum was created'. NEW: Search options / Archive files: Added the option 'Log password-protected files'. NEW: Search options / After the search: Added the option 'Play sound file'. 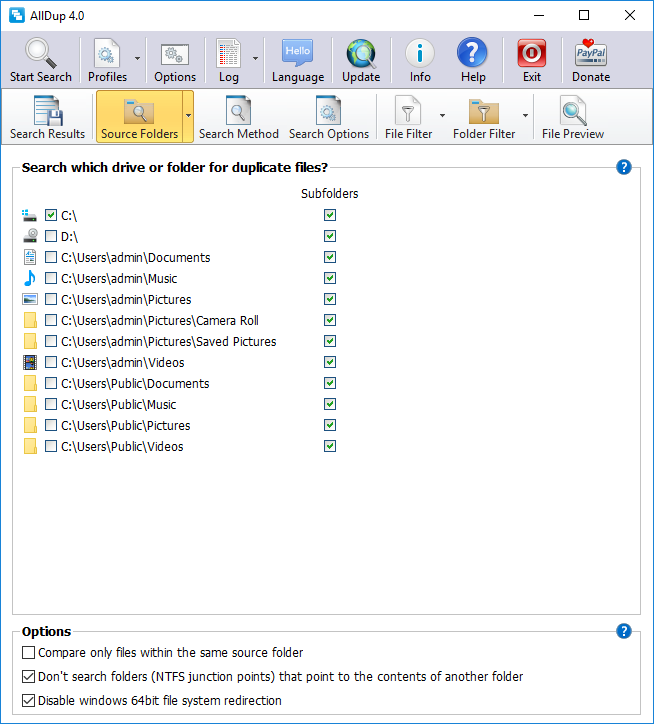 UPD: The archive option 'Folder to extract temporary files from archives:' was renamed to 'Folder for store temporary files:' and moved to the general options. NEW: Search result / Progress window: The new button 'Options' enables you to perform the following actions after the search is done: 'Play sound', 'Save search result', 'Put PC into sleep mode' and 'Hibernate PC'. NEW: Search result / Menu bar: The new menu 'File Protection' enables you to activate/deactivate the file protection for each source folder. NEW: Search result / Menu bar 'Search result': Added the menu item 'File preview'. 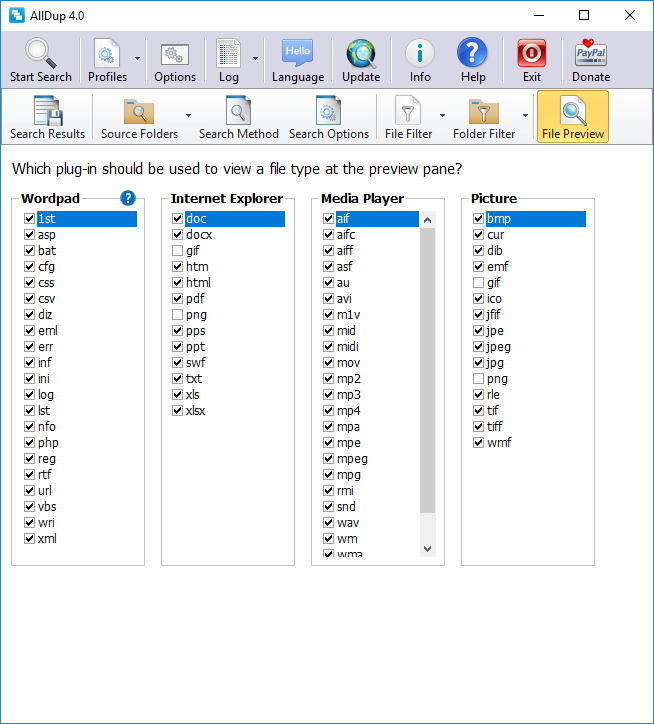 NEW: Search result / Toolbars: The new toolbar 'File Preview' enables you to activate a single PlugIn to display all files with this PlugIn only. NEW: Search result / Toolbar 'Select': The new button 'Undo the last select or deselect action' enables you to reverse the last select or deselect file action. NEW: Search result / File context menu: Added the command 'Remove file extension from the Plugin lists'. NEW: Search result / File context menu: Added the menu item 'File actions'. 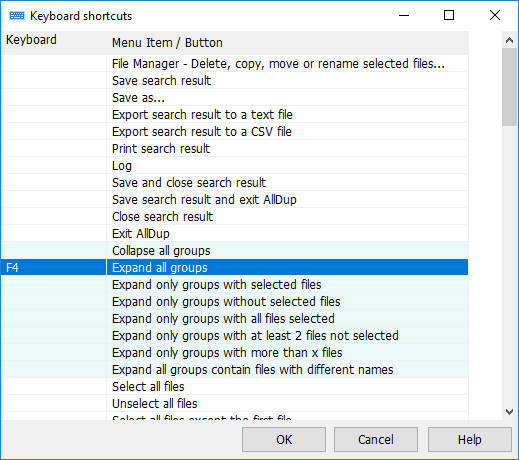 Doing a right click on a file while pressing the CTRL key will display the new file actions menu only. 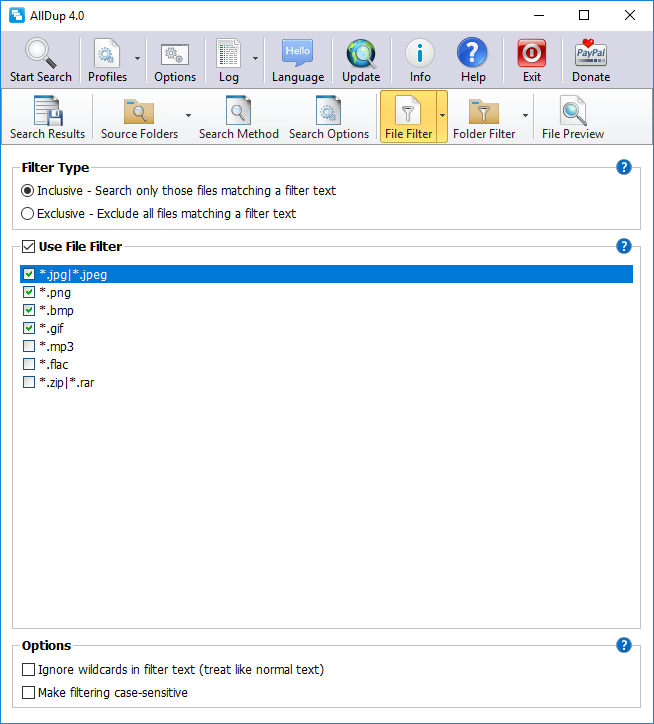 NEW: Search result / File context menu: Added the file actions 'Copy file' and 'Move file' to the new file actions menu. 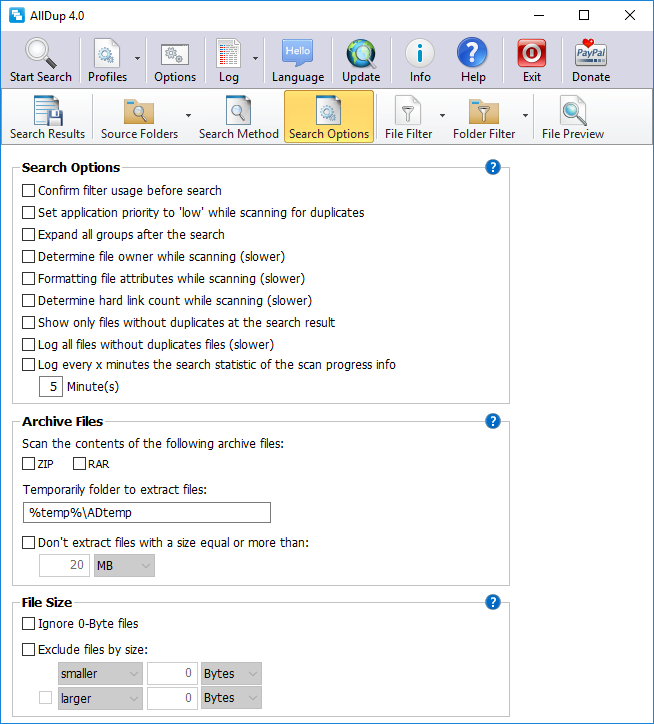 UPD: Search result / File context menu: Moved several file actions (e.g. 'Rename file', 'Delete file', ...) to the new file actions menu. NEW: Search result / File preview: The new PlugIn 'VLC Media Player' enables to play all common audio and video files at the file preview pane. NEW: Search result / File Preview: The new PlugIn 'MediaInfo' enables you to view technical information about media files, as well as tag information for many audio and video files. NEW: Search result / File Preview: The new PlugIn 'EXIF Data Viewer' enables you to view EXIF data from files with the extensions JPEG, JPG, TIF, TIFF, PNG, GIF and WAV at the file preview pane. 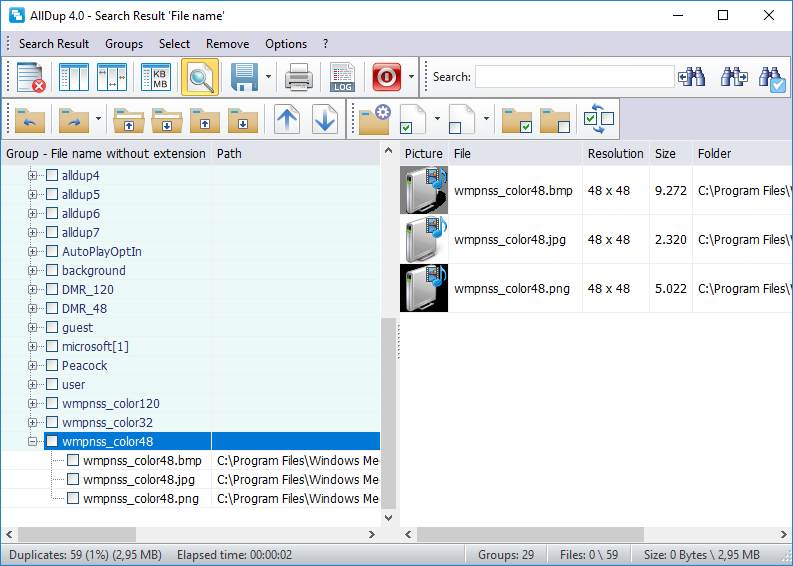 UPD: Plug-In 'Image Viewer': Now you can view image files with the following extensions: BMP, CUT, DIB, DNG, EMF, GIF, HDP, ICO, IFF, J2C, J2K, JP2, JPE, JPG, JPEG, JPX, JFIF, PBM, PCX, PGM, PNG, PPM, PSD, RAS, TGA, TIF, TIFF, RAS, RLE, WBMP and WMF. NEW: File Manager / Delete: Now you can delete files from inside 7z-archive files. NEW: File Manager / Delete: Now archive files will be deleted if you want to delete a file from inside the archive and the archive contains only this file. NEW: Command-line: Added the option -sa to start a search with the comparison criteria 'Similar Music'. NEW: Command-line: Added the option -l to specify the scan length for the comparison criteria 'Similar Music'. NEW: Command-line: Added the option -a to specify the compare method for the comparison criteria 'Similar Music'. 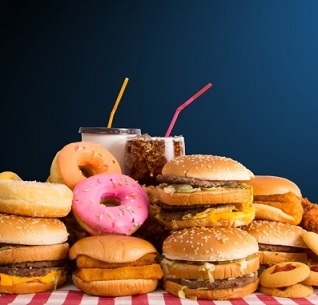 75 245 Michael Thummerer <img src="https://www.oldergeeks.com/downloads/gallery/thumbs/alldup1_th.png"border="0"> Mar 20, 2019 - 10:58 4.3.0 13.08MB ZIP , out of 1 Votes.